Leader of the Indigenous People of Biafra (IPOB), Nnamdi Kanu, was yesterday released from the Kuje Prisons in the FCT. Following his release, Kanu arrived the Federal High Court in Abuja in a private car accompanied by his lawyers, family members and sureties. The sureties include the chairman, South-east Senate caucus and former deputy governor of Abia State, Senator Enyinnaya Abaribe, a Jewish High Chief Priest, Immanuu-El Shalom and a chartered accountant residing in Abuja, Tochukwu Uchendu. 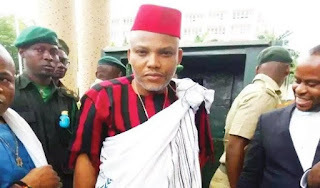 Kanu, who was in cheerful mood, arrived the court around 6.35 pm in a black Mercedes 4Matic GL 550 jeep with registration number: ABC 46 MU, wearing Lilac attire with Biafran embroidery. 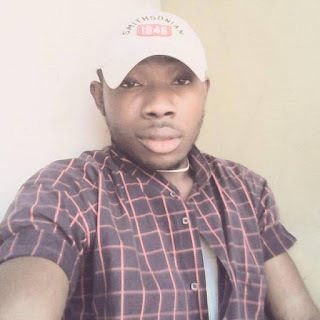 He was ushered into the Process Unit of the court where he signed his portion of the bail bond before proceeding to take pictures with well-wishers. He left the court around 6.45pm. Justice Binta Nyako Tuesday granted Kanu bail in the sum of N300m, bonds and three sureties in like sum. According to the judge, the sureties must include a renowned Jewish leader in Nigeria, a political leader of Igbo extraction such as a senator and a highly respected citizen with landed property in Abuja having a verifiable Certificate of Occupancy.